When one mentions waffles, the image that usually comes to mind is a plate of freshly made waffles drenched in saccharine maple syrup or topped with ice cream. But contrary to what you may think, waffles can also be enjoyed paired with savoury ingredients instead of always sweet ones. Savoury waffles are not uncommon but they are not as readily available as their sugary counterparts. 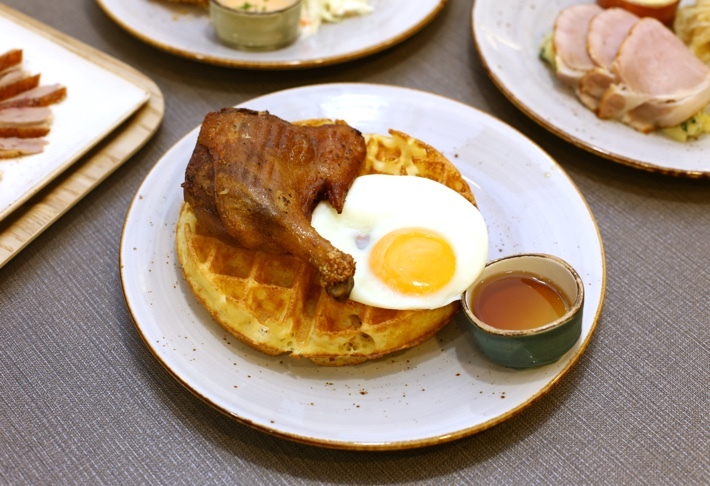 There are a number of places that serve up some pretty solid chicken waffles but don’t restrict yourselves to just that; some places even have some pretty interesting creations such as duck confit waffles, smoked salmon waffles and chicken waffles topped with kimchi! If you’re someone who doesn’t have a sweet tooth and you’d like to have a savoury waffle for a change, we are here to help you suss out where you can find some of the best savoury waffles in Singapore. Here is our list of 10 places in Singapore to get savoury waffles. If you have a voracious appetite for fried chicken, you’d definitely love Clinton Street Baking Company and Restaurant’s chicken and waffles. The chicken accompanying the waffles here is huge! We also love how well seasoned the chicken is and how each bite is chock full of flavour. As each serving is pretty massive, we recommend those of you who have smaller appetites to share this with someone. Duckland’s name is an easy giveaway to what waffles they specialise in — duck waffles! Their Duck Confit & Waffle features a fork-tender confit duck leg that is encrusted in a smoky, crisp skin that brims with intense flavours of duck fat. We recommend drizzling some of the provided maple syrup over the waffle for a whole new experience. Who can resist these adorable Gudetama themed waffles? Certainly not us! Their Eggcited Cajun Chicken with Waffles is marinated to perfection and to seal the deal, it’s topped with an adorable Gudetama egg. Both Insta-worthy and delicious! 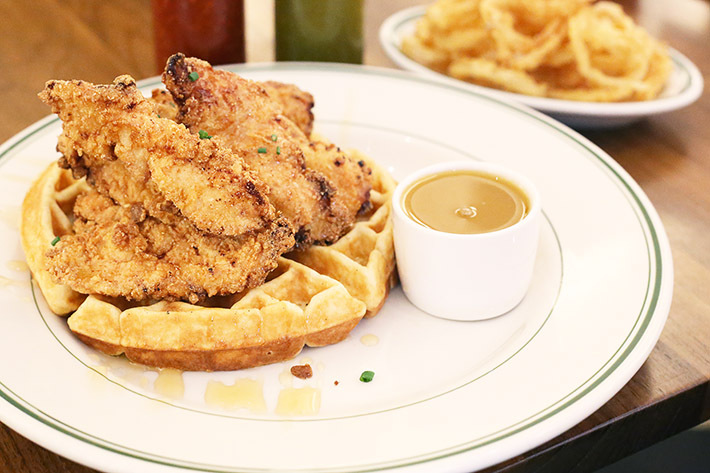 Serving popular American diner fare, OverEasy’s Momma’s Chicken & Waffles served with warm maple butter is undoubtedly one of the better Chicken & Waffles on this list. The chicken here is fried to a satisfying golden crisp which is further enhanced by the syrupy maple butter. Revelry specialises in waffles and is a waffle lovers paradise. They have every kind of waffle out there that you’ve ever dreamed of such as Prawn n Cheese Waffle, Truffle Scrambled Eggs Waffle, O.K. Waffle Pizza and even a waffle burger! The massive portions are also a major plus, making this one of our favourite places to head to for waffles. Ever heard of a Korean fried chicken waffle? We didn’t until we came across Stateland Coffeehouse and here, they have a completely unheard of waffle creation — Spicy Korean Fried Chicken with Kimchi Slaw! We love how the kimchi adds an interesting tangy touch to the entire dish that surprisingly works. If kimchi isn’t your thing, they also have the basic Korean Fried Chicken Waffle and Soy Korean Fried Chicken Waffles. The Beast’s Chicken and Waffles is made using their Signature fried chicken. We appreciate how the chicken comes in a massive slab that covers the entire waffle; truly value-for-money! If you like your chicken waffles with a touch of sweetness you can also drizzle some of their one-of-a-kind house-made bourbon maple butter sauce on top of it. It would be an absolute crime to do up a list of places that sells waffles and leave out Waffletown. The retro fast food joint is famous for its American-style dishes that mostly consist of waffles. 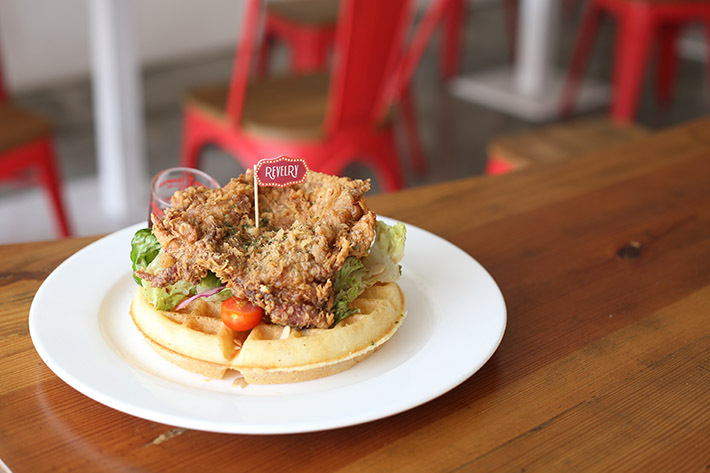 Aside from the usual array of ice cream waffles, they sell a really mean chicken waffle that we honestly can say is one of the best in Singapore. Tucked away in Punggol is Whisk & Paddle, a place where you get to enjoy your waffles with an amazing view of Punggol Waterway. We love how they paired their fluffy waffles with savoury smoked salmon as well as two beautifully poached eggs. It’s incredibly satisfying to break open the egg and watch all that runny yolk coat the waffles and salmon. New kid on the block Wild Wood Cafe serves up some pretty solid brunch food and one of the things on their menu that caught our eye was their selection of creative waffles. Here, you can get your hands on Egg Benedict Waffles, Ham & Cheese Waffles and Smoked Salmon Avocado Waffles.